MP3 Section has been changed slightly. Another classic Initial D album Initial D -D Selection 3- has been uploaded. Total downloadable MP3s: 94. There will be two new Initial D music albums coming out soon. One is Super Eurobeat presents Initial D Absolute Album feat. Keisuke Takahashi, on sale internationally on November 29th, 2006. The other one is Super Eurobeat presents Initial D Fourth Stage SuperEuro-Best, its release date has confirmed to be December 13th, 2006. Just in time for Christmas. ;) Make sure to check back later for more Initial D music. MP3 Section has been updated. Another old Initial D album Initial D -D Selection 2- has been uploaded. Total downloadable MP3s: 82. MP3 Section has been updated. We've added the latest Initial D CD album Initial D Fourth Stage D Selection 3 for your sampling use. We've also released a high-quality torrent (320kbps) version of this album, visit the forums and the BT section for more information (Registration not required). On the other hand, an old Initial D album Initial D -D Selection- has also been uploaded. Total MP3s available for download in MP3 section is now 67. We strongly urge you to purchase the CD albums if you like the music. As a reminder, the files we provide in MP3 section are for sample only! Make sure to check back later, because more samples will be uploaded. Note: Bandwidth and webspace costs money. If you appreciate the service we provide here and the way we run this website, please show your support by visiting our sponsored links around the site. Thank you. MP3 Section has been updated. A new CD album Initial D Fourth Stage D Selection 2 has been added. More new CD albums will be added soon, check back later. Please bear with me as there are tons of updates. The new album Super Eurobeat Presents: Initial D Fourth Stage D Selection 3 mentioned in previous update is going to release on September 27th, 2006 in Japan. If you still haven't place your pre-order yet, now it's a good time. Click here to pre-order it. For track listing and discussion for this CD album, please visit our forums. Last but not least, I've added a new album in MP3 Section. The new album is Super Eurobeat Presents: Initial D Fourth Stage D Selection + Check them out if you haven't already done so. I will upload more songs in the upcoming weeks. Check back later. 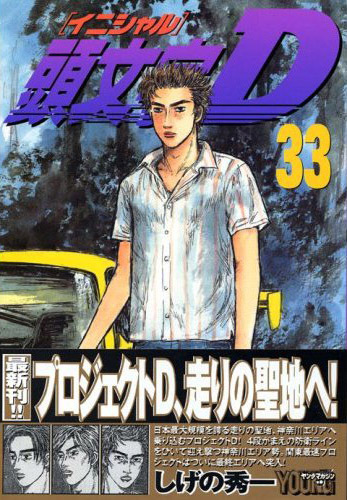 After two whole months of delay, Initial D Manga Vol.33 has finally been confirmed to release on August 19th, 2006. Pre-order it at YesAsia.com now for $6.99. As expected, there will be yet another CD album coming out for Initial D Fourth Stage. The new album Super Eurobeat presents Initial D Fourth Stage D Selection 3 has been confirmed to release on September 26th, 2006. Visit YesAsia.com to pre-order it for $27.75. The Pictures Gallery Section has been slightly re-done. Check out the special effect when opening an image. MP3 Section has also been re-done. Check them out. There will be massive uploading of songs within the next few weeks. Stay tuned. With Initial D Fourth Stage came to an end, many people were wondering when Fifth Stage would come out. To answer that, we must first understand that the anime is closely based on the manga. The manga was first introduced in 1995, the latest issue is Volume 32, which was released in November, 2005. As we all saw, Fourth Stage was somewhat rushed, and as a result, Fourth Stage managed to cover 15 volumes in the manga (Vol.17 ~ 31). That's almost half of all of the storyline in Initial D !! One thing to note is that, Fourth Stage left off at Volume 31. Since then, there has only been one issue released, and that was Volume 32. According to reliable source, Volume 33 will be released this month. Even then, there will only be two volumes of storyline to make the anime. (Fifth Stage) Bottom line, we won't be watching Initial D Fifth Stage anytime soon, simply because there aren't enough storyline to fill it. 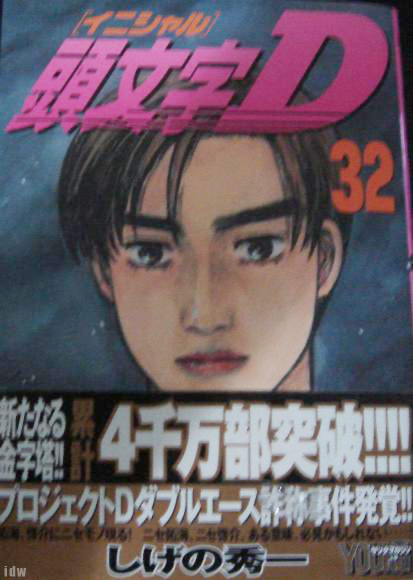 The author of Initial D, Shigeno Shuichi, usually release a new volume every five to six months. Base on my personal speculations, we should see Initial D Fifth Stage releasing by late 2008 or early 2009. If you are interested in buying Initial D manga Vol.32 or Initial D manga in general, you can visit YesAsia. User Gallery Section updated with two (2) new wallpapers, be sure to check them out. On the other hand, we've added a new section in Download Section. Live Stage is a Initial D World community effort in re-making some of the scenes featured in anime and manga. The idea is sort of like the Initial D Live Action movie, except that we are not producing any movie for the moment. Due to the lack of resources, there are many limitations on our parts. We will be doing our best in producing the highest quality work and present them to you. To get a taste of how Live Stage is like, we've provided a sample wallpaper at the Download Section. Feel free to tell us what you think of this idea. At last, Live-evil / Ideology has released the fansub of Initial D Fourth Stage Episode 24. Get it through BitTorrent while it's still active or request for direct downloads in our forums. As usual, visit animesuki.com or click here for the torrent link. Also, you can download all 24 Fourth Stage episodes as a single torrent (4.2GB) by clicking here. Check back for more Initial D updates. Initial D Fourth Stage Vol.12 DVD has been released today in Japan. If you are interested in ordering a copy for $48.99, please visit YesAsia.com. This will be the last batch of Initial D merchandise for a long while unless avex plan on releasing more Initial D music albums. It's possible that avex might release another D Selection for Fourth Stage, but currently there are not enough evidence to support that notion. On the other hand, I've completely revamped the Picture Gallery. There will be specs of the cars alongside the images from now on and we will try our best to have these specs as accurate as possible. Special thanks to Chidoki for providing these technical information. Last but not least, please stop sending us E-Mails asking when will Initial D Fifth Stage come out. We do not know. We'll update this page as soon as we get some solid confirmations on that. Thank you. Live-evil / Ideology has just released their Fourth Stage Episode 23 fansub couple hours ago on animesuki.com. Click here for the torrent link. Or request for direct download links in the official pinned thread on our forums. Also, Links Section updated, added a few new links. Check them out. On February 23, 2006, SEGA released a PSP game called Initial D Street Stage. 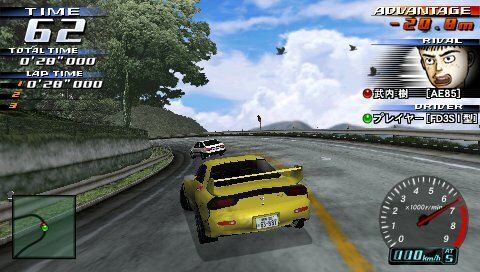 Basically, it's Initial D Arcade Stage Ver.3 but now you can play it everywhere you go on your PlayStation Portable. The feedbacks on the game itself has been very positive so far. Visit the Official Game Site for more information. And visit YesAsia.com to obtain a copy of it for $49.99. On the other hand, Links Section has been updated. User Gallery Section has also been updated, two new wallpapers added. Minor updates. Most links in Download Section have been fixed, that includes the little mini game in Games, all the links in Real Audio and all the song links in MP3 section. If you can't wait for the release of LE/IDE's fansub of Fourth Stage Episode 23 - 24, you can get the fansub for those two episodes in our forums. Read the first post for more information. I was informed that the subbed version of episode 23 by LE/IDE will come out within this week. Please come back for more updated news. avex mode had announced the release of a new Initial D album earlier last month. The new album is called Super Eurobeat Presents Initial D Absolute Album feat. Takumi Fujiwara, release date is confirmed to be March 23rd, 2006. The album contains 14 songs, ranging from First Stage to Fourth Stage. From the very first song played in First Stage, Space Boy to the blood-pumping Forever Young, played during Episode 6 in Fourth Stage, all featured in this album. Visit YesAsia.com to pre-order this album for $40.75 Also, I've finished fixing up the User Gallery Section. Please send all submissions to idforums[at]gmail.com. Initial D Fourth Stage Vol.11 DVD was released on February 15th, 2006. Visit YesAsia.com if you would like to obtain a copy of it for $48.99. In case you haven't noticed, we changed our splash page. We also added a new section of the site - initial D Arcade. The site's goal is to unite every Arcade Stage players around the globe. Currently, Arcade Game Stage is maintained by razorsuKe. If you have any questions regarding that part of Initial D World, please contact him. Fourth Stage episode 23 - 24 is currently airing in Japan. Use the links below to get the torrent of the raws. For updated information, please visit this thread. Episode 23 - 24 will be discussed there. These two episodes have been confirmed as the last two episodes for Initial D Fourth Stage. While it's sad to see it ends, it has also been confirmed that there will be more Initial D. Though, currently we do not know when it will come out. Be sure to check back often as we will keep you updated on the latest Initial D news. Anyways, here are the links to the raws for Episode 23 - 24. Enjoy. Welcome to the brand new Initial D World main site. For the past half years, we've been working on this new layout. Finally, we can put it up for the public to see today. We are really excited as this new layout is even easier to navigate and the color combinations are carefully picked to ease the strain of your eyes. This site's URL is http://www.go2id.net. Please change your bookmark if you haven't already done so. With that said, feel free to browse around, but expect lots of dead links and under construction pages because we are still working on some of the pages. We'll keep you posted as we put the finish touches on the site. Thanks for your patience and continuous support. avex mode had announced the release of yet another CD album for Fourth Stage. 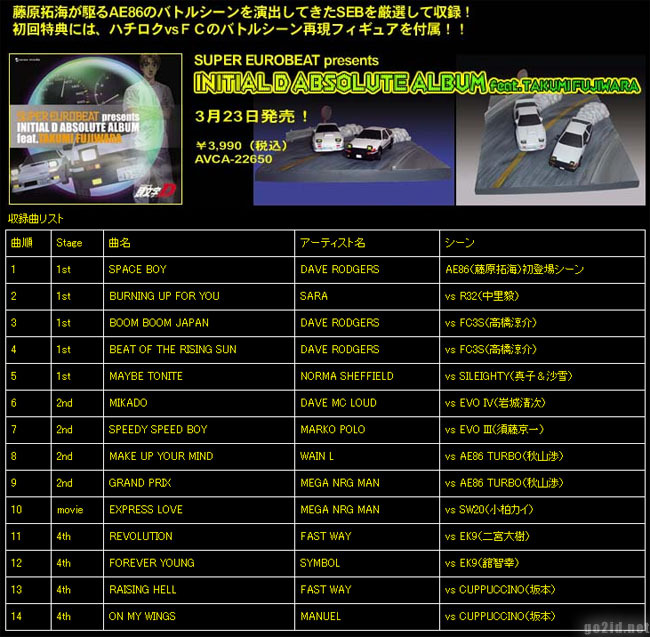 The title of the album has been confirmed as Super Eurobeat presents Initial D Fourth Stage D Non-Stop Selection. The release date for this album is January 25th, 2006. You can order it right now at cdjapan.co.jp right now for $25.41 (3,059yen). Initial D Fourth Stage Vol.10 DVD had also released last month. Visit YesAsia.com if you would like to obtain a copy of it.